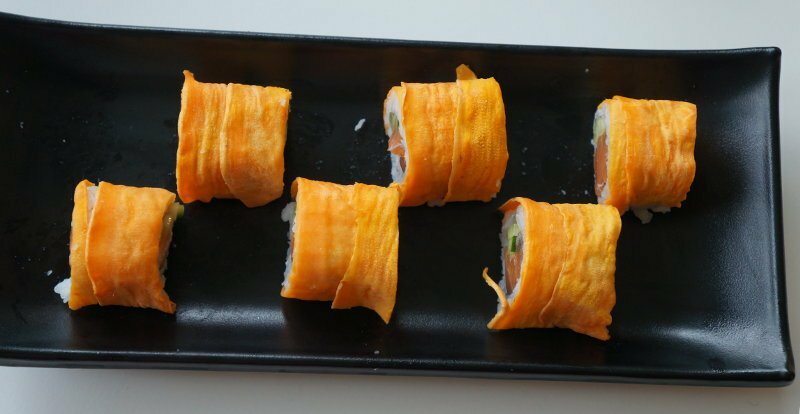 "Batata Roll" (sweet potato) Sushi Recipe - Easy and Delicious! 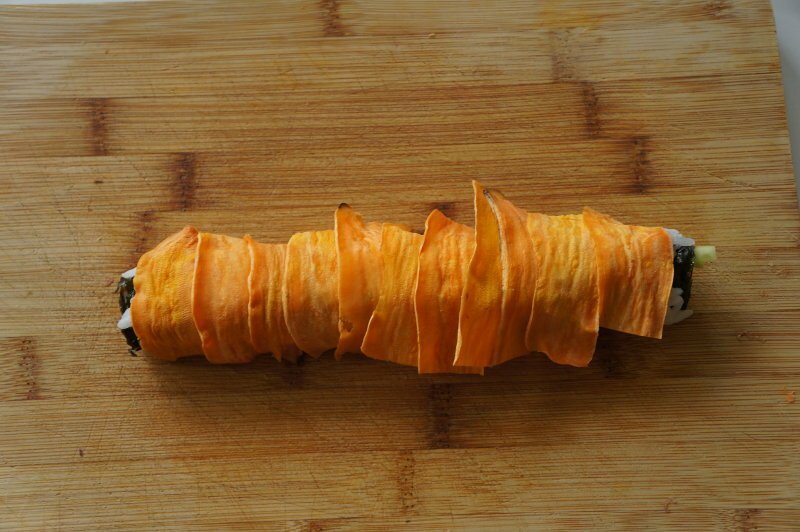 "This recipe shows you how to sweet potato wrap your inside out sushi roll. You can use that wrapping on many different type of rules - it looks and tastes great!" 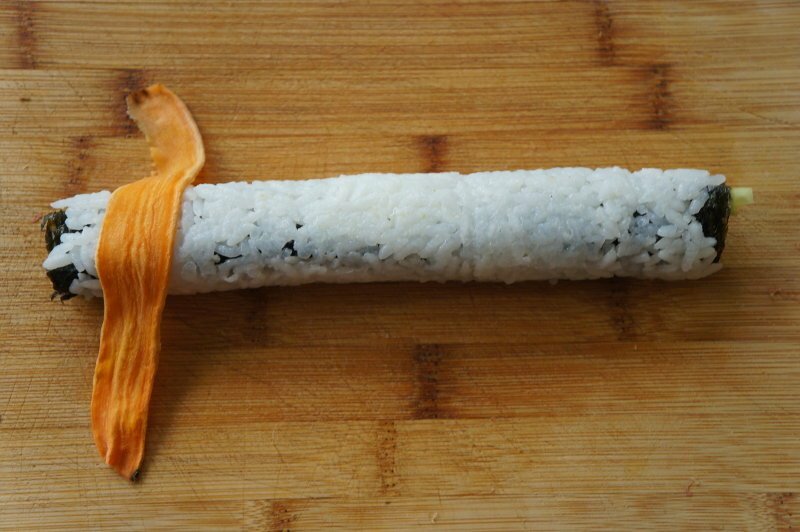 Just to make sure we are all on the same page, we are going to make sushi out of this. And other things as well. Keep scrolling to see how it rolls. You know the drill. Peel the sweet potato nicely. 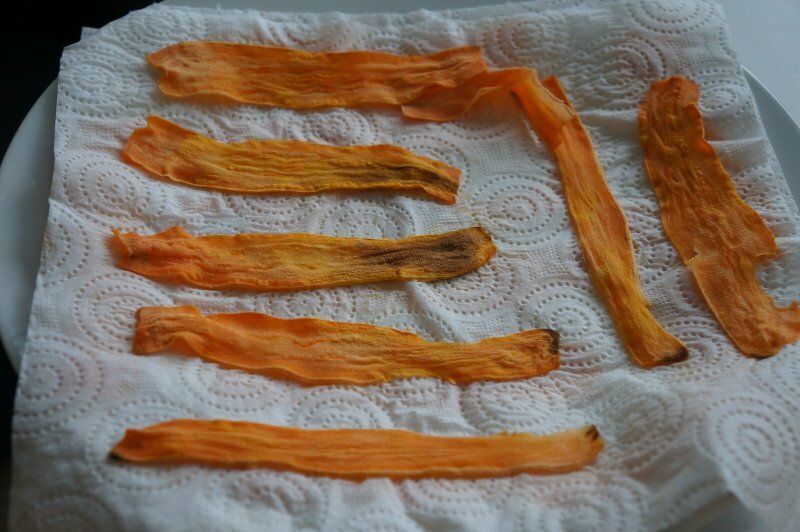 Remove the ends, as well as any bad looking parts you don’t like to have in your food. 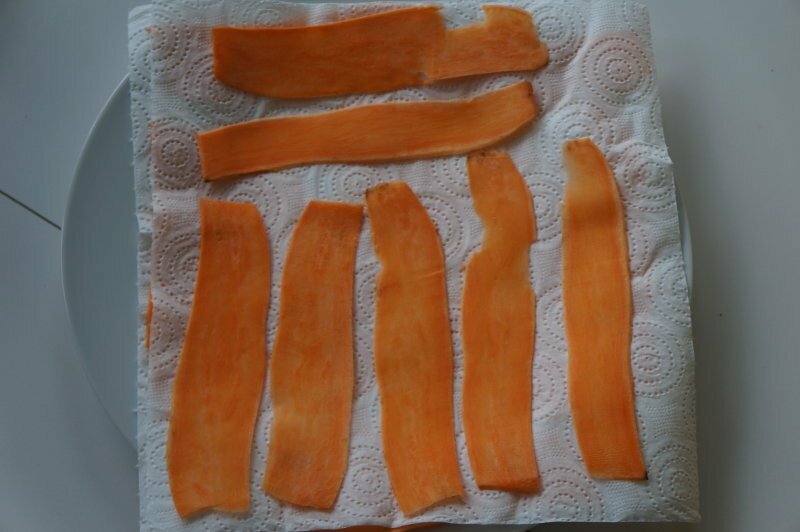 Now, using your hard vegetable peeler, peel layers of the sweet potato. 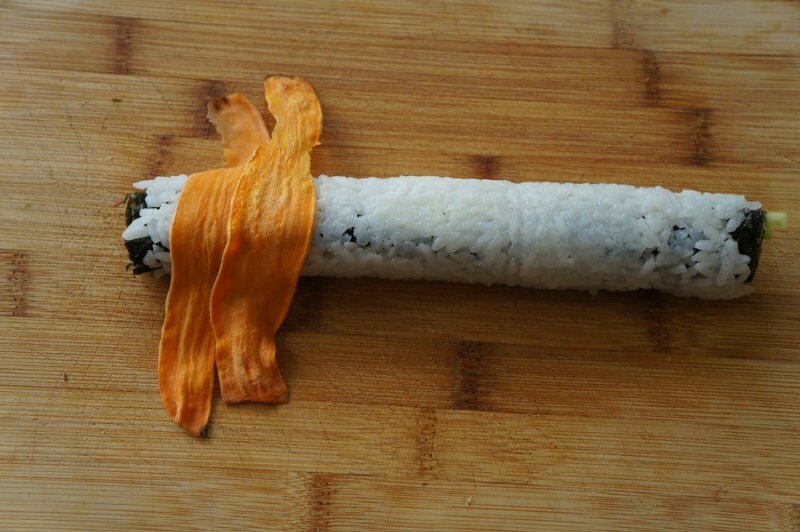 This will create nice thin cuts – perfect for sushi wrapping. 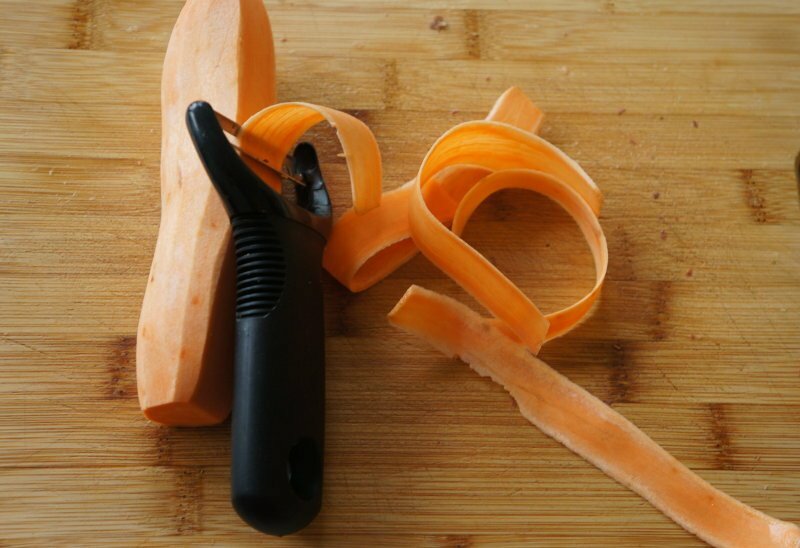 You might have to press the peeler harder than usual to get an even cut. It should look something like the below. While peeling, it made sense to stack them up together to save kitchen space – after cooked you should avoid it as the slices might stick. 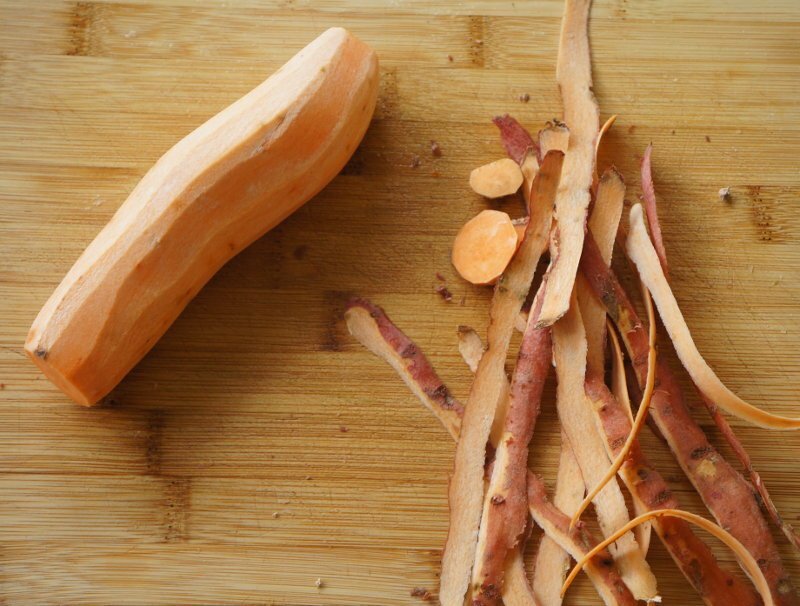 You might not need to entire sweet potato. About 8 slices like the below should do per one sushi roll. 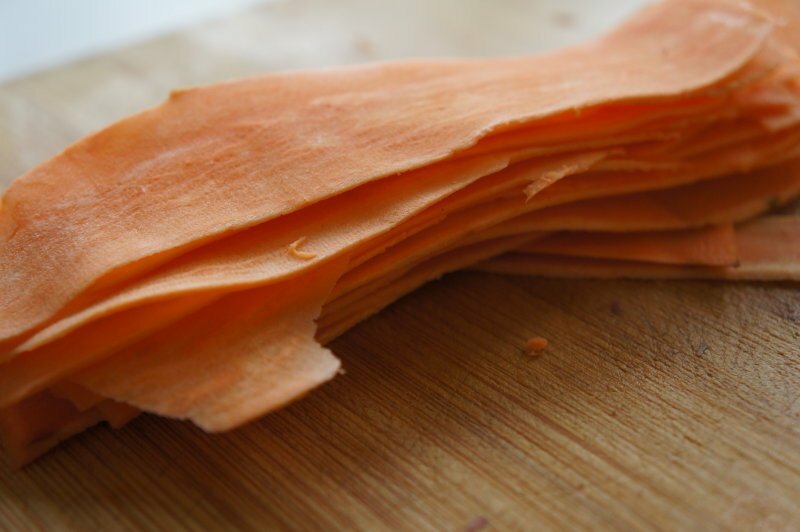 You can either fry, oven or microwave these sweet sweet potato layers before you can use them on sushi. Microwaving is the fastest & easiest choice. But first, you will need to lay it on some paper towels as shown below. Depending on your microwave, it should be about 20-40 seconds until it gets soft enough. Below is the “after” shot – I know it looks a bit shriveled and lifeless, but worry not – it will look great on the roll in just a minute. 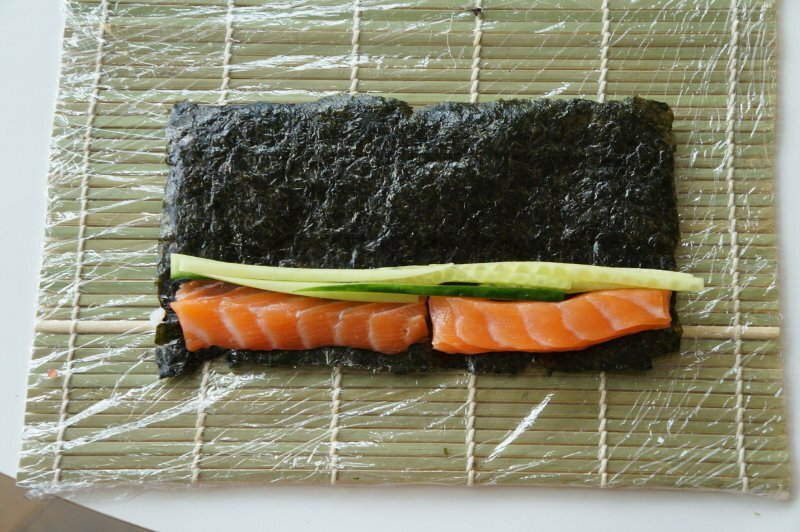 Take a nori sheet and cut it in half. Place one half on top of the bamboo mat with the rough side facing up. Store the other half in a dry place for the next roll. Wet your hands with water and grab a handful of rice from the rice tub. 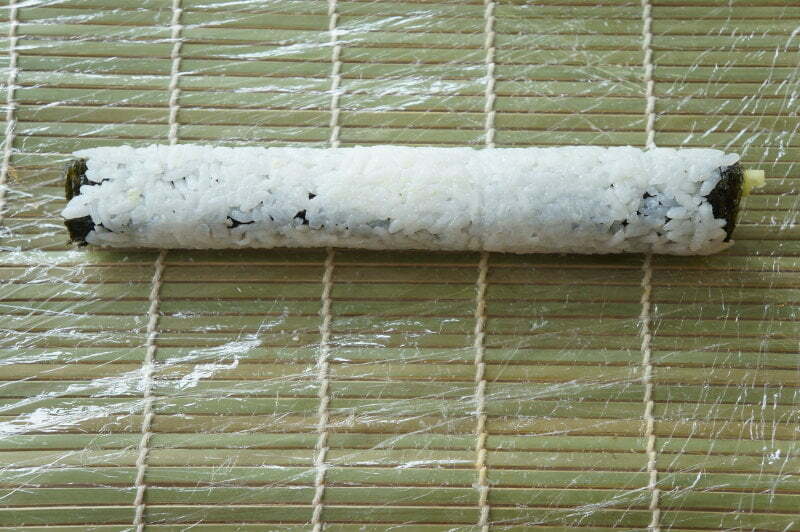 Form the rice into a ball, and “drop” it at the center of the nori sheet. Spread the rice around the nori so it covers it equally. There is no need to press the rice down, just spread it around. Now flip the nori so that the rice is facing down. Next, we are going to line up the roll filling. It’s how I roll. But you can go with something different. Boiled carrots and or avocado will also go fine here. Some kampyo if you have it. Use thick and even slices of salmon and as much cucumber as you like. Try to keep it as even as possible. And roll. If you need any help with rolling, check out my other page showing step by step how roll your inside out sushi, so that it looks something like the roll below. Ok cool. Now take one slice of microwaved sweet potato, and gently lay it on top of you roll, just as shown below. I’m right handed myself so I started with left end of the roll and worked my way to the right end. Nice. Now take another slice and place it similarly on the roll making sure there is a little bit of an overlap of sweet potato. Just a few millimeters of overlap should be enough, almost unnoticeable. Cover the entire roll this way. If the layers are too long you can trim it with a knife like I did. 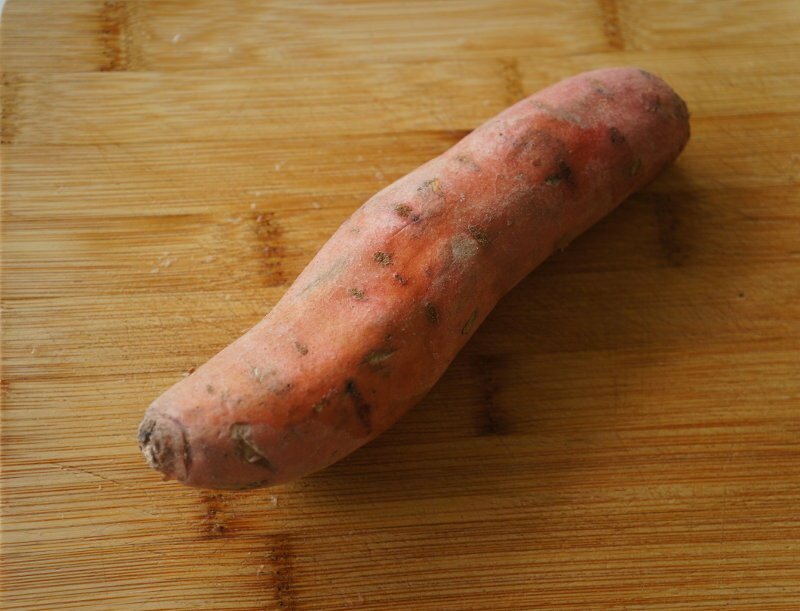 The sweet potato should be long enough to cover all 3 top sides of the roll but not the bottom. Making sweet potato great again! Wrap your bamboo mat around the roll and press the sweet potato tight onto the rice from all three top sides of the roll. This will help fixing things to place, and give the topping a great look. 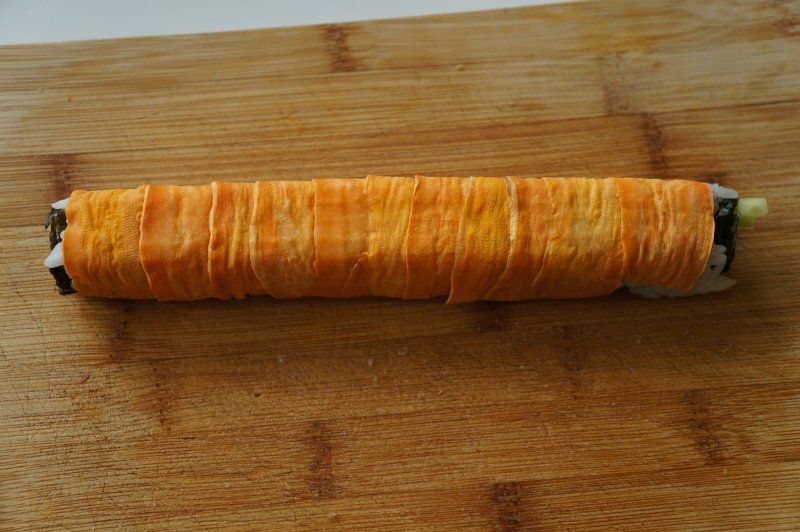 Cut the roll as you would normally to 8 or 6 pieces. In this cases I sadly decided to get rid of the roll ends (I took care of it personally, nothing went to waste). 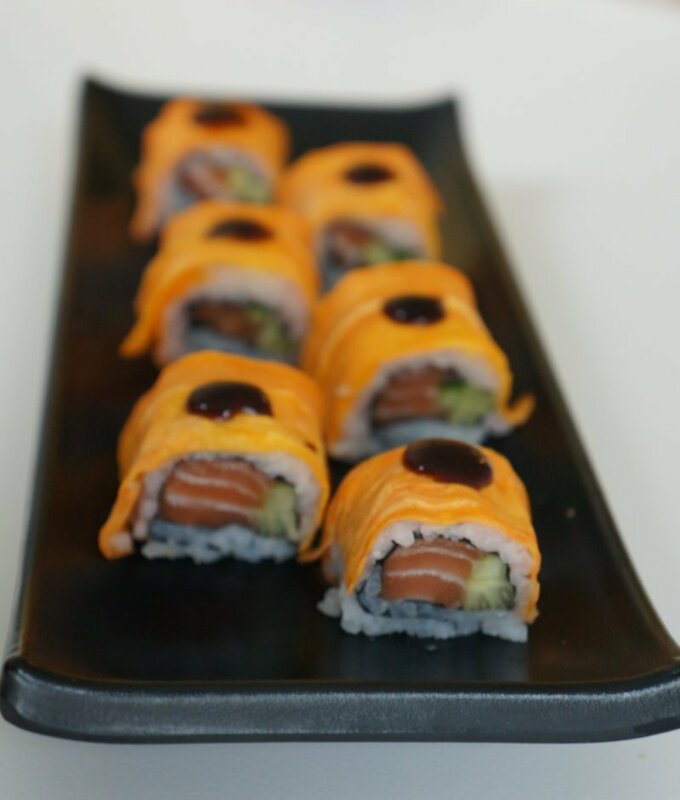 A drop of Teriyaki sauce does wonder for this roll, try it out!